According to the 1962 Missal of Bl. John XXIII the Extraordinary Form of the Roman Rite, today is also the feast of St. Christopher who suffered martyrdom in Asia Minor about the year 250. The devotion of our fathers, taking its due from his name (Christopher means bearer of Christ), caused them to place colossal statues of the saint bearing the infant Christ on his shoulders at the entrance to cathedrals. Thus arose the legend of the giant who carried the child Jesus over a river... and the devotion to St. Christopher as the patron of motorists and all forms of transport. 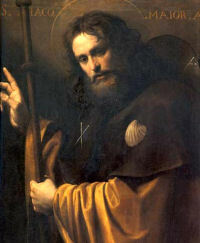 He is one of the Fourteen Holy Helpers.